Your guinea pig requires fiber to keep his teeth wearing properly, as his teeth grow throughout his life. While alfalfa contains fiber, it's too rich in calcium for guinea pigs to consume as a diet staple, so choose another type of hay to keep his teeth in fine fettle. 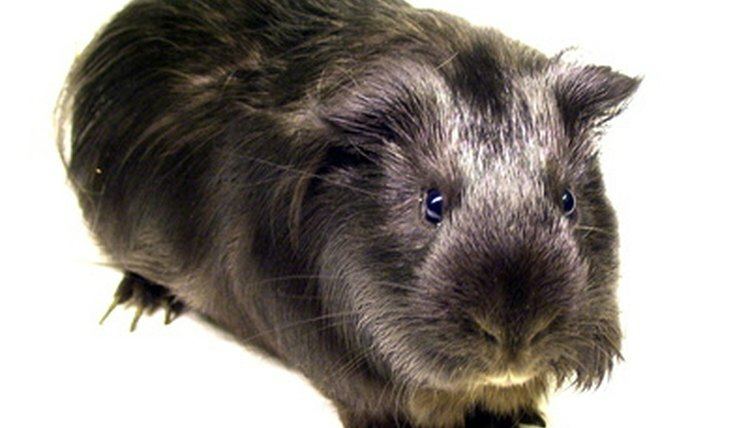 You can feed alfalfa to guinea pigs at specific times in their lives, though. Rich, deep green alfalfa hay looks and smells good enough for you to eat. While it's packed with vitamins, minerals and proteins, all that alfalfa goodness is just too much for guinea pigs. Those excess calories your pet consumes when munching on alfalfa can quickly lead to obesity and other health issues. While you can feed your guinea pig small amounts of fruits and vegetables for snacking, skip greens containing a lot of calcium for the same reasons you shouldn't feed alfalfa. These include kale and parsley. At certain times of life, alfalfa hay is an appropriate feed for guinea pigs. Pregnant and nursing guinea pigs, and babies under the age of 6 months, need extra calcium and protein in their diets, so feeding alfalfa is fine for them. The best types of hay for your guinea pig's regular fare include timothy hay, wheat, orchard grass oat and brome. If you buy small bags of hay in pet stores, your choices might be limited. If you have other hay-consuming animals, such as horses, goats or llamas, you can serve the same hay to your small pets. You can also use hay as bedding for your guinea pig; he can rest and snack at the same time. Not only does hay provide fiber for your guinea pig's teeth, but as roughage it keeps things moving in his gastrointestinal system. Many pelleted guinea pig feeds consist of alfalfa. A timothy-based pellet is a better choice. High-quality commercial guinea pig pellets are formulated with the vitamins and minerals your pet needs. Although pelleted feeds for small animals might look much the same, don't feed your guinea pig feed created for rabbits, hamsters or chinchillas, and vice-versa. Guinea pigs require a great deal of vitamin C; feeds formulated for them contain sufficient amounts of this necessary supplement. Ask your vet about additional vitamin C sources for your pet. Is Copper Toxic for Pygmy & Dwarf Goats? What Kind of Food Do Horses Eat? What Is a Clydesdale Draft Horse's Diet?